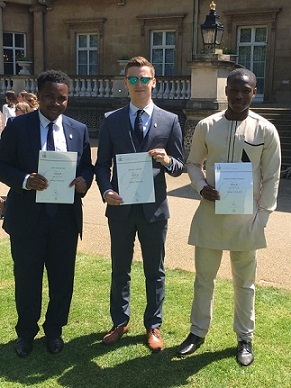 Congratulations to former students, John Raji, Alex Sinclair, John Earl-Sodhi and Anthony Adesanwao who received their Gold Duke of Edinburgh Award from Sophie, Countess of Wessex, at Buckingham Palace on Thursday 17th May 2018. All of the recipients also met and listened to a motivational speech by Team GB Hockey Gold medallist, Christa Cullen. As you will be aware, on 24th April 2018, Ofsted carried out the first short inspection since the school was judged to be good in February 2015. I am delighted that the inspection team agree that the leadership team has maintained the good quality of education in the school since the previous inspection and St Thomas More continues to be good. I am very pleased that the inspection team understood the distinctive nature of our Catholic school as students talk proudly about being a ‘Tommy More boy’ and identify the importance of being part of the ‘family’ community. Remain up to date with school events and future developments! Find out what clubs and activities are running this term! Find out more about how you can get involved here. Students will return Tuesday 23rd April on Timetable Week 2. The school email system is online! The Virtual Learning Environment is online! The School Gateway is online! Click here for more information about our new build project. We aim to develop the school’s community to provide a disciplined, caring and stable environment in which pupils can achieve their best and develop as confident young people, well prepared and fully equipped to make a positive contribution to the wider world as responsible citizens. As a Catholic school we respect each pupil as a unique person with God given gifts, qualities and particular needs.